Are you a porridge fan? I can’t say it’s my favourite food and oats aren’t high on my list these days, but I know you may like them, so hey, here’s another way of playing with porridge for breakfast or a power snack. I can’t help but recommend gluten free as the best choice, gluten being a digestive issue for many. Trust me, making this almond milk takes less time than reaching for a slice of bread and buttering it. You’d eat a whole almond. Right? So don’t worry about straining this milk. Just pour 1 1/2 glasses of water into your blender alongside your almonds and blend them for 1 minute. 30 seconds will do, if you’re using flaked almonds – they take less time to break down. Milk. Done. Pop your oats into a saucepan, followed by the almond milk. On a low to medium heat, cook the porridge to runny/stodgy, whichever you prefer. There you have it: A way to sweeten your dish without adding honey/rice syrup/palm sugar etc. Yes, it’s fruit juice, but with the fibre, you’re adding something to your diet that the other sugars listed here don’t offer and you don’t need much to sweeten the dish. The above is a stepping stone to cutting down on sugar in general, if that’s what you’re looking to do. You could use any fruit this way, including another, better option … blending some whole berries to make a raw fruit coulis. Fermented and whole fruit being a superior choice to fruit juice. You could also ferment your porridge first and add the almond milk as the sweetener. My own favourite remains fermented porridge, cooked with the fermented water and cold coconut kefir added after cooking, to sweeten. That sounds good! 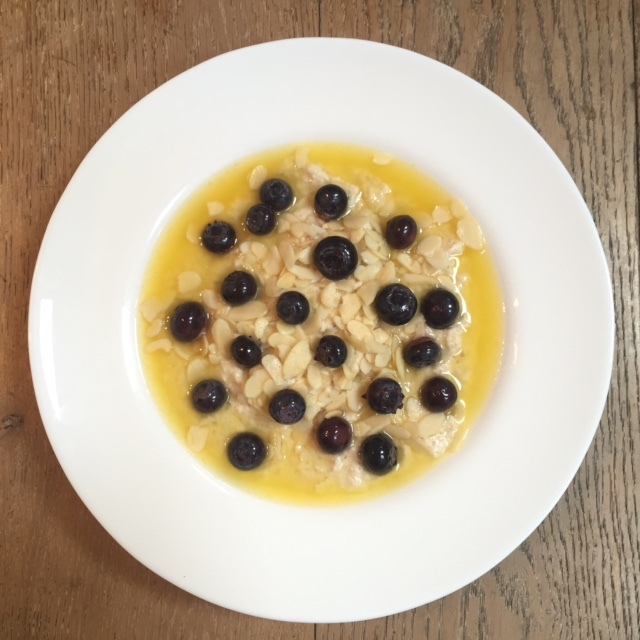 Certainly will put a new spin on porridge – I often make it with fresh apple and rhubarb juice but this sounds lovely.